Darren Till says his time at welterweight is definitely limited but he's not trying to cash in on the current trend of champion versus champion fights in the UFC. Darren Till knows his time at welterweight is limited. As one of the biggest fighters in the entire division, Till has spoken often about his difficulties cutting down to welterweight. In fact, Till has twice missed the mark when cutting down to the 171-pound limit for a pair of non-title fights in the past. Lately, Till has been bombarded with questions about his upcoming weight cut where he will be expected to hit 170 pounds or less for his title fight against Tyron Woodley at UFC 228. 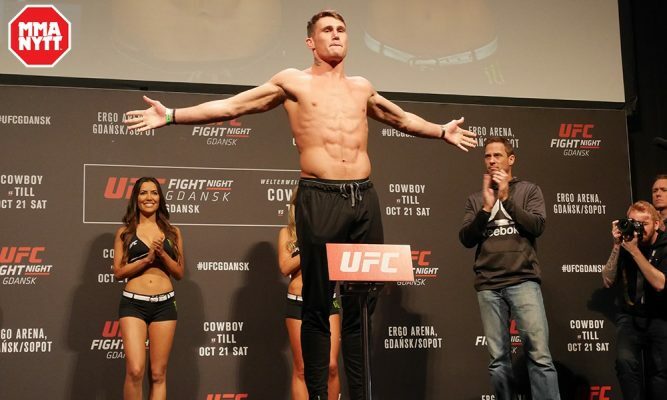 Of course, Till understands the concern considering he failed to make weight in his most recent fight against Stephen “Wonderboy” Thompson, not to mention a video that was released days later where the British fighter lost the ability to see during a particularly brutal part of his attempt to get down to 171 pounds. That’s why Till knows his days as a welterweight are already numbered but he still has business left to handle in the division so he’s not going anywhere just yet. “I just f–king hate it,” Till said about cutting weight ahead of UFC 228. “I could be three kilos from right now, I just hate it. I’m good. I’m OK. This is probably the leanest I’ve ever been two weeks out. I’m lean, I’ve got more muscle than my last fight. I’ve probably got about the same muscle as the fight before with[Donald] Cerrone and that weight cut, that was a piece of piss. Let’s hope it’s the same. There have actually been a trend of fighters moving up a division lately to avoid those brutal weight cuts and then finding immediate success. Anthony Smith has scored two knockouts over a pair of former champions since moving to middleweight to light heavyweight. Kelvin Gastelum is on the cusp of a title shot at middleweight after suffering through several tough weight cuts at welterweight. Of course the biggest example right now would be Robert Whittaker, who started his career in the UFC as a welterweight before moving up to 185 pounds and now he’s the reigning UFC middleweight champion. Till plans on following their example after only a few more fights. As far as moving to middleweight and immediately competing for gold, Till promises that plays no part in his decision making about venturing up to 185 pounds. Going to middleweight for Till would be about health and longevity and he’s more than happy to prove himself to the contenders in that division before jumping the line to get a title shot. “When I take that belt, I want to defend the belt and then I want to go up to middleweight,” Till explained. “That doesn’t mean I want to go up to middleweight and challenge the champion. I would like to earn my stripes in that division, too. Ultimately, Till’s goal at middleweight would be the same as welterweight and he’d want to eventually become champion. Of course if the UFC came calling to offer him that opportunity — much like his fight against Woodley next weekend — he’s never going to turn that down.